I’ve been home all week by myself — such a luxury. Wait. I know you would rather have your hubbies home with you but for me it is wonderful to have so much quiet time. [I’m pretty sure I will burn in heck for thinking such awful and mean thoughts.] I’ve been able to read and watch and type and sleep and it doesn’t get much better than that. What? I shouldn’t tell the truth? 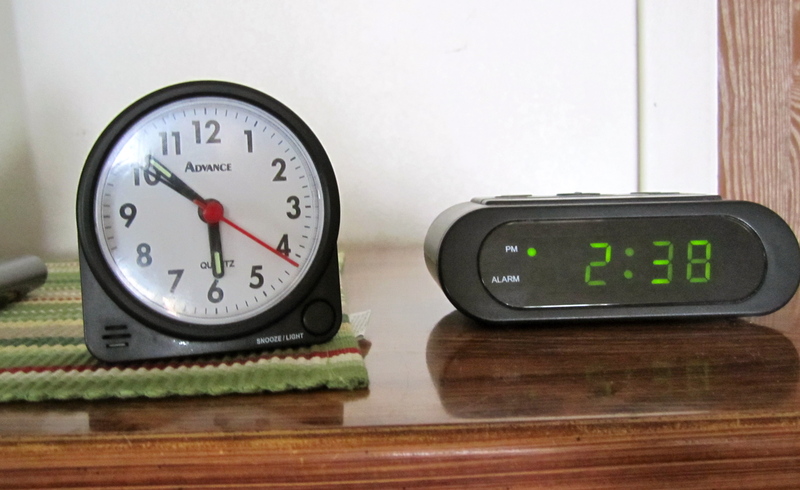 The other thing that really makes me nutso is that hubby now has the five alarm clocks. He bought a big new clock that neither one of us could figure out. It has Alarm 1 and Alarm 2. Then the little black one goes off nearly every single hour. And if you set it for 5 a.m. it goes off at 5 p.m., as well. His old, white, trusty standby works most of the time and it’s the one he usually counts on. The other digital on the tall dresser is not loud enough to wake him. Oh, it wakes me, for sure! In fact, they all wake me. Hubby usually sets all five of them — oh, I forgot, he also sets his cell phone — for 4:30 or so. But, the crazy thing is, he automatically wakes up at 4:15. Herein lies the problem! Herein lies the reasoning of why I love to be home alone! He wakes up at 4:15 but he doesn’t turn off any of his five alarms. He goes in the bathroom and, well, sits, for a while, and I have to either listen to all the neglected and bawling alarms or I have to go and turn them all off! One morning, I put every single one of them under his matrtess. And just one more little thing. He takes my toilet paper. Seriously. And I know I have mentioned this a dozen times before. But when he runs out of TP he will go into my bathroom and take mine [without so much as a warning] instead of walking down the nine steps to the basement where we have two cases. [TWO CASES]! So yes. I’ve been home all week by myself — such a luxury.